The card harmony gives balance restraint and moderateness. In the picture there is to be seen a couple of swans - that shall embody grace and perfect harmony to glide over the water. The card harmony gives balance restraint and moderateness. Also it stands for balancing out the opposite and opposite forces. First of all contrarily is to be connected. By this should be regarded to find the right measure and get along right in the middle. The harmony teaches us to give in to balance of the body, mind and spirit – and for your soul: to keep energy in flow. Significance of self-restraint would have been visible. Mindfulness is the gateway to social competencies. So you are prepared for the best to find your personal peace of mind. This card symbolizes creation and maintenance of peace. Sustainability- weigh up varieties that will lead to success. The negative side of this tarot card means it is to be avoided to show any conflict and hide confrontations. But maybe it is needed to show absolute significance of your discontent. Necessity to confront your surroundings by making clear what is disturbing. The right measure may be drawn into consideration – do not miss the lack of ambition. Consider your behaviour and do not mistake conformity by tolerance. Reflect kinds of intolerance and mediocrity are not recommended for wishful behaviour and development. 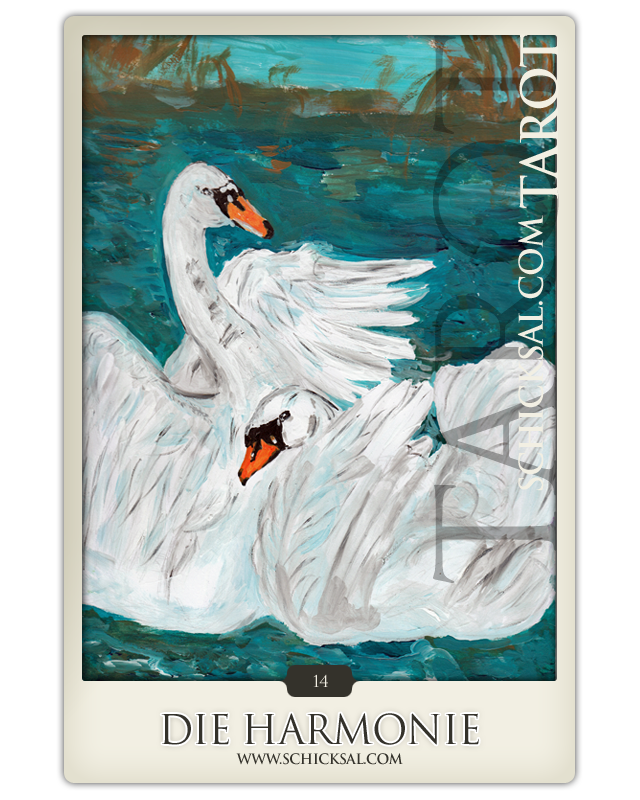 The tarot card harmony symbolizes relationship which is signed by profound mutual confidence. It symbolizes that the scales are in perfect balance – each side of the composition shows the same. Great attributes are confidence and respect. In another case of conflict it presents the call for solution. Dialogue and conversation are important attributes to find support and finally adequate solution. Harmony in a relationship is carried by deep affection and profound confidence. Today you should try to find a good mood wherever you are – doesn’t matter if you find yourself in am office or if you stay at home – in professional life or if it is concerning your private life. Dispute is exhausting - do not be afraid of anything – you might handle your affairs. Today runs fine and do not worry about anything else. Conciliatory behavior works pacifying. Treat others like you wanted to be treated self – then the ambience must become friendly – an ideal start for staying together in harmony.